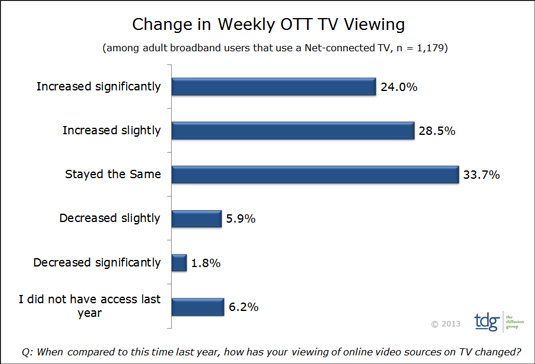 More than half of consumers with a connected TV have increased their use of over-the-top broadband TV sources in the last year, with 24 percent reporting a sizable increase according to data from the TDG Group. This television includes sources like Netflix (s nflx), YouTube (s goog) and Hulu, and the group’s research notes that this isn’t necessarily good news for the pay TV companies that are seeing subscriptions decline. Meanwhile, with the rise in consumption of internet TV there’s a decline in pay TV subscribers. 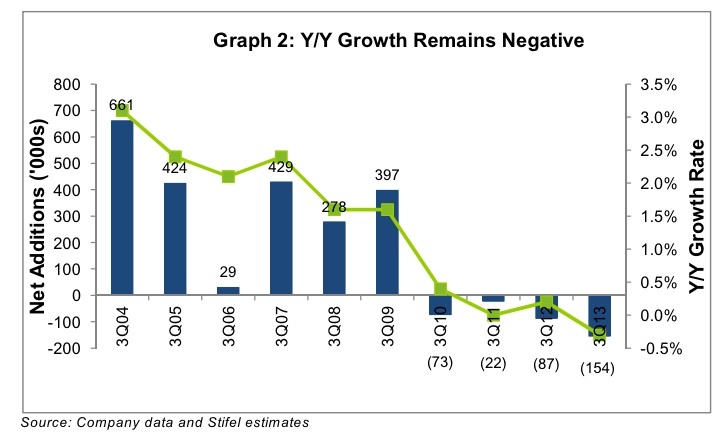 This is the third consecutive quarter of such quarter-over-quarter declines according to investment bank Stifel Nicolas, which notes that the economy is improving and people are building houses again. Growth in housing is generally correlated to growth in cable subscriptions. So while a whopping 86.8 percent U.S. homes have cable, they are also spending more time enjoying internet services, which may lead more to question the value of paying high cable fees. However, if cable companies can take what consumers enjoy from such over-the-top services like on-demand programming to any device and still keep a lock on quality programming they have an enviable hunk of the market. “How long will that be true?” Who cares? Why this infatuation to ignore where the majority of consumers and customers are TODAY, and for many more TOMORROWs ?????? It is not true that 86.8% of homes have cable. That is the number of households that have an Multichannel Video Program Distributor (MVPD) subscription. At least a quarter of those are DBS customers, and another significant chunk are telco video customers. Streaming companies like Netflix are at the mercy of Internet Service Providers (ISPs) like cable companies. If ISP decides to slow down the streaming of Netflix videos, then Netflix is useless. And as more and more ISPs getting into the field of movie streaming themselves, it will get clearer that eventually Netflix business will be seriously hurt by FREE movie streams provided by ISPs. This FREE trend is starting to show up on Verizon and some cable companies like Charter. Not to mention YouTube has always been free and starting to take away Netflix market share. Netflix is just a big bubble stock with no growth. Last quarter, after all the hypes, Netflix only grew revenues by pathetic 3%. In contrast, real growth stock like TSLA grew revenues by 48% for the same period. No growth bubble stock NFLX can fall 90% and still has a PE twice more expensive than the market PE.